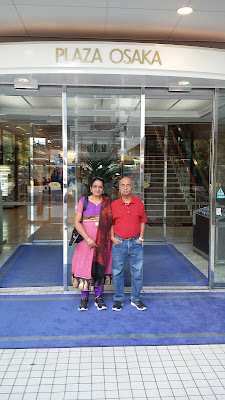 After our first day's experience in Yokohama, we woke up in our hotel room in Osaka, fresh after a good night's sleep - all ready for the day's sightseeing in Kyoto, Nara and Osaka. At Hotel Plaza Osaka's restaurant, we enjoyed a sumptuous continental breakfast, including pancakes and french fries and lots of fresh tropical fruits and canned fruits. boarded our coach and started our one hour drive for Kyoto, the former capital of Japan. Our first halt was at Kinkaku-ji (literally 'Temple of the Golden Pavilion'), a Zen Buddhist temple in Kyoto, overlooking the lake. 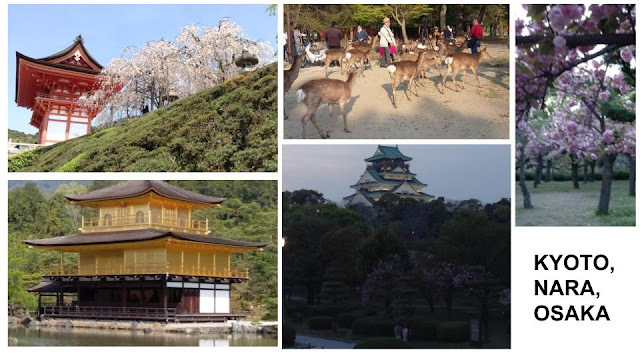 Set in a magnificent Japanese landscaped strolling garden in the go-round style, it is one of the most popular tourist attractions. It is designated as a National Special Historic Site and a National Special Landscape. It was originally built in 1397 and rebuilt later. 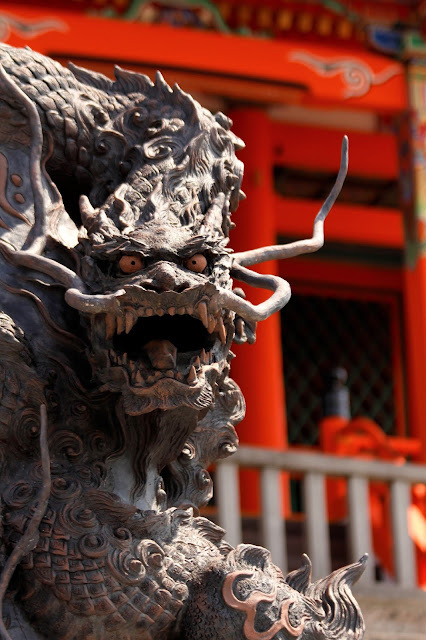 On July 2, 1950, at 2:30 am, the pavilion was burned down by a 22-year-old novice monk, Hayashi Yoken, who then attempted suicide on the Daimon-ji hill behind the building. He survived, and was subsequently taken into custody. The monk was sentenced to seven years in prison, but was released because of mental illnesses in 1955; he died of tuberculosis within six months. 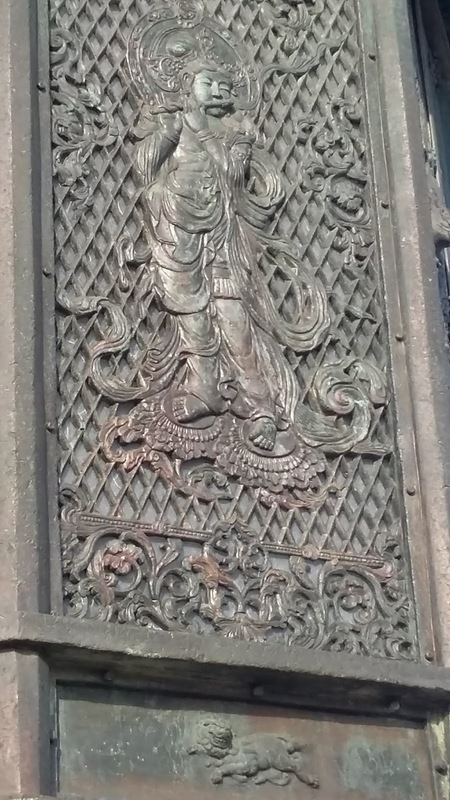 The reconstruction is said to be a copy close to the original. 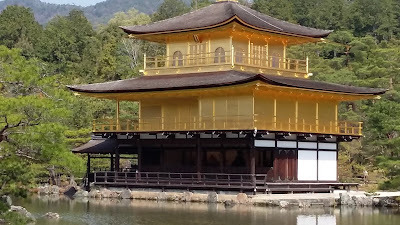 The name Kinkaku is derived from the gold leaf that the pavilion is covered in. 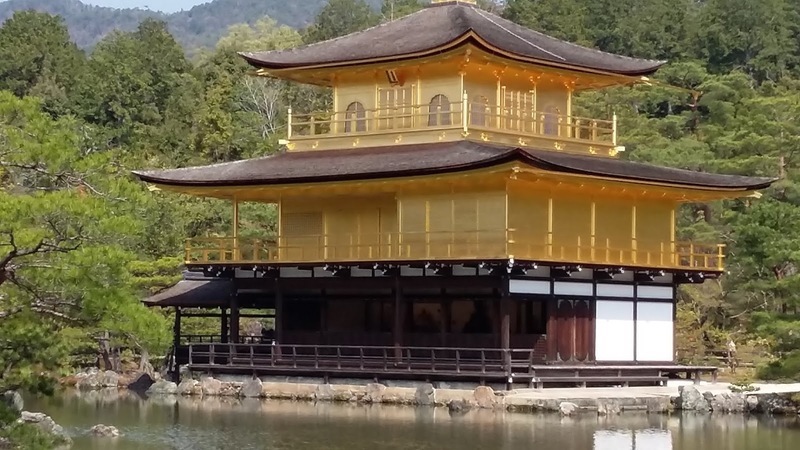 Gold was an important addition to the pavilion because of its underlying meaning - the gold employed was to mitigate and purify any pollution or negative thoughts and feelings towards death. 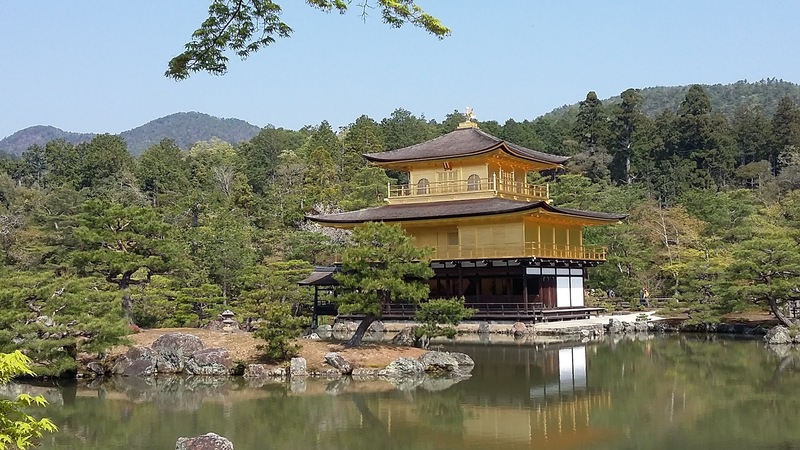 The Golden Pavilion also creates a visual extravaganza because of the sunlight reflecting and the effect the reflection creates on the pond. The temple set in the midst of a pond, seemed to be standing majestically on an island, surrounded by trees and greenery. Temple, pond and trees are typical of every Buddhist shrine, we were informed. The roof ornament also stands out. 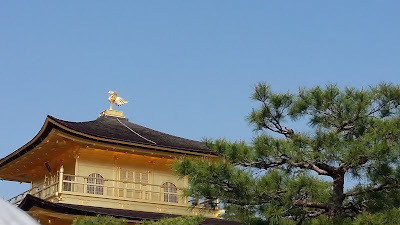 We spent an hour looking around The Golden Pavilion. We didn't fail to notice the cherry blossoms dotting the place. 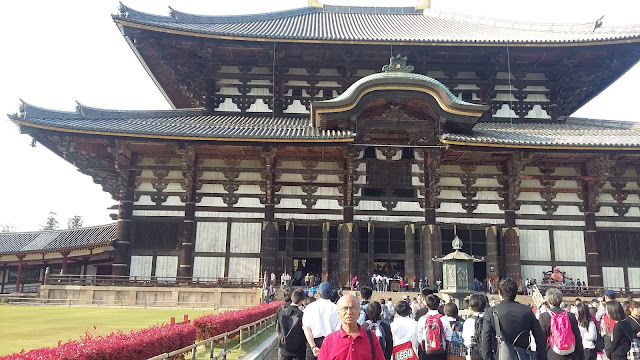 We then proceeded to the 400 year old Nijo Castle, one of the seventeen Historic Monuments of Ancient Kyoto which have been designated by UNESCO as a World Heritage Site. We had to take off our shoes before entering inside. 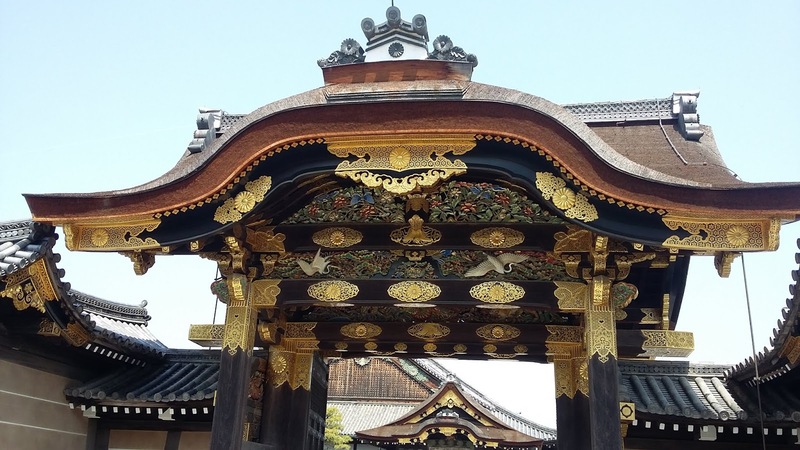 Nijo Castle has two concentric rings of fortifications, each consisting of a wall and a wide moat. The outer wall has three gates while the inner wall has two. The inner walls surround the Inner Ward, which contain Honmaru ("Inner Ward") Palace with its garden. The ornamental gate has the Ninomaru ("Second Ward") Palace, the kitchens, guard house and several gardens located in the Outer Ward. One of the most striking features of the Ninomaru Palace are the "nightingale floors" in the corridors built in such a way as to squeak like birds when anyone walks on them, a clever measure to protect the occupants from sneak attacks and assassins. Photography is not allowed in some portions of the castle. We spent an hour looking around. Then it was time to drive to Kiyomizu-dera, also in Kyoto. 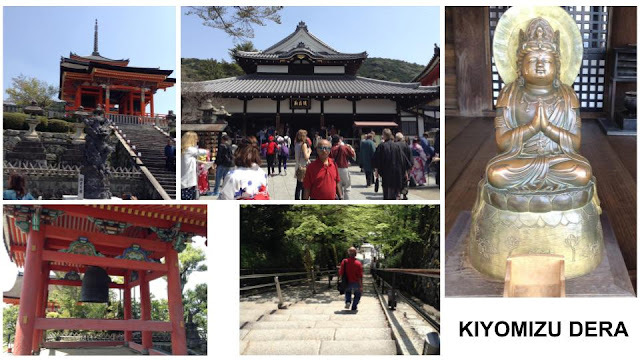 Kiyomizo temple is located in the midst of mountains. from edible stuff to souvenirs - actually a good place for souvenir shopping, though a bit high priced. souvenirs, to throngs of visitors. 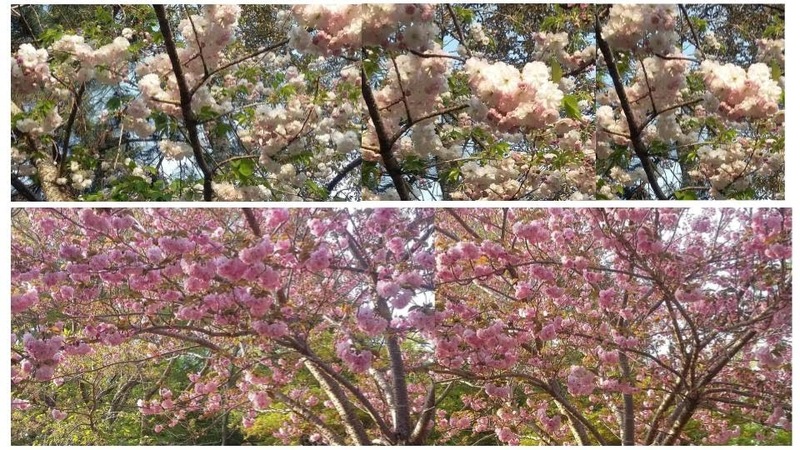 Once again we were thrilled to see more cherry blossoms around, which added to the beauty of the place. The temple complex includes a pagoda, several other shrines, some of them in bright orange. Among them is the Jishu Shrine, dedicated to god of love and "good matches". 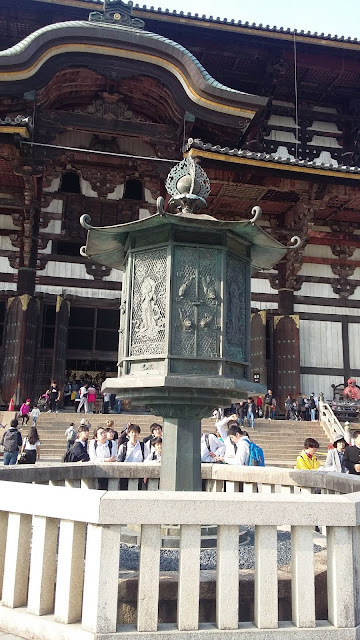 Jishu Shrine possesses a pair of 'love stone' placed 18 meters apart, which lonely visitors can try to walk between with their eyes closed, to find true love. We also saw the statuettes of Ksitigarbha - which reminded me of Navaratri 'Kolu' at home. Interestingly there is the waterfall where visitors drink for good health, longevity and success in education, again reminiscent of Indian culture! 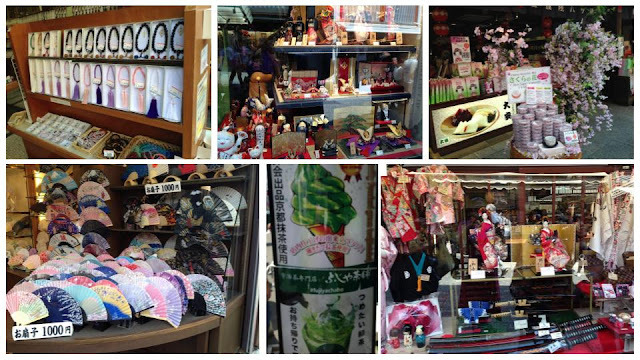 The complex also offers various talismans, incense, and omikuji (paper fortunes). 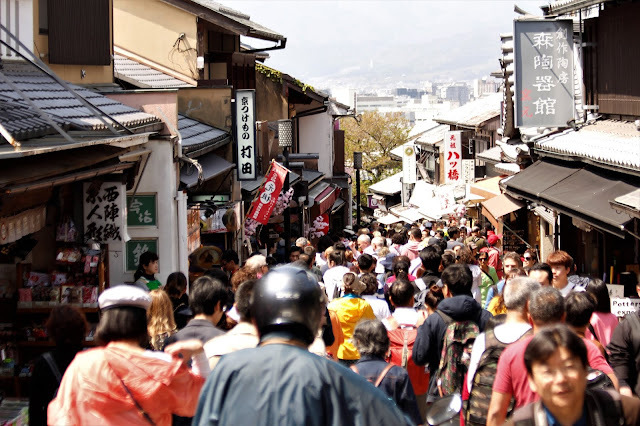 In 2007, Kiyomizu-dera was one of 21 finalists for the New Seven Wonders of the World, but was not picked as one of the seven winning sites. 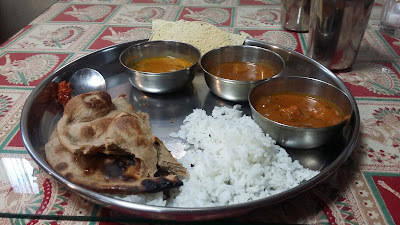 Lunch was at Jay restaurant, where we were served tasty lunch on our thalis. We then drove from Kiyoto to Nara, a 40 minute drive. We visited Todaji temple and Deer Park. 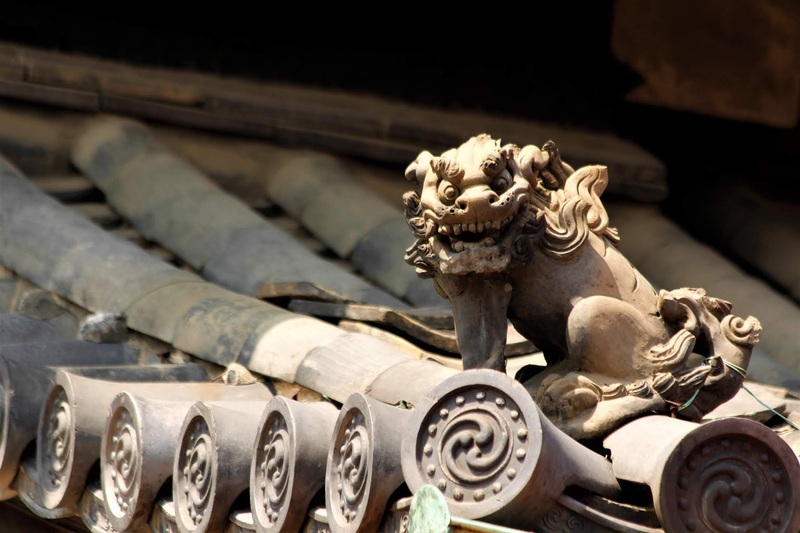 Todaji temple is a Buddhist temple complex, once one of the powerful Seven Great Temples. 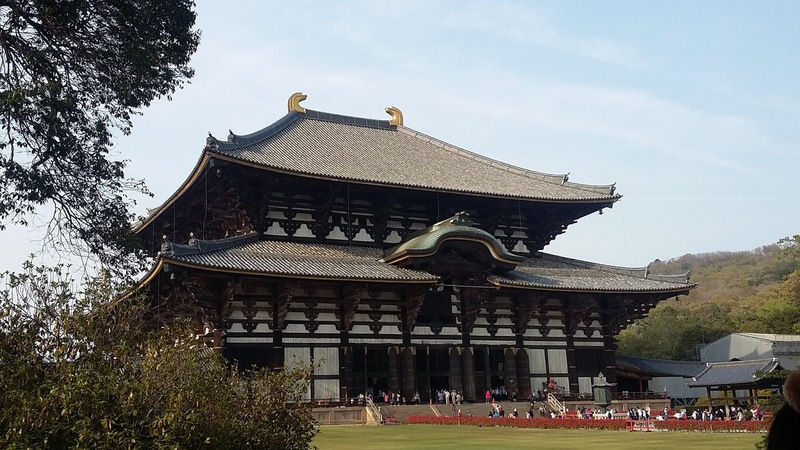 The temple is a listed UNESCO World Heritage Site as one of the 'Historic Monuments of Ancient Nara', together with seven other sites including temples, shrines and places in the city. 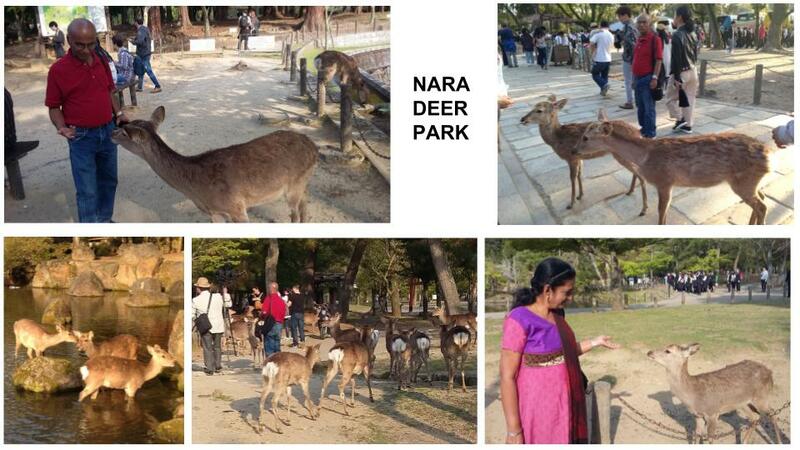 Adjacent to it, is the Deer Park. 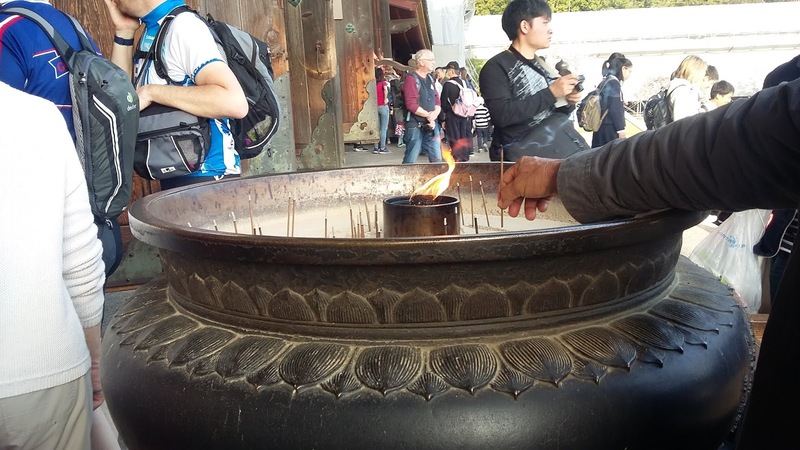 As we entered Todaji Temple,, we saw a large bowl, where incense sticks were burnt by devotees. We couldn't help noticing the carvings - which reminded us so much of our 'Gods'. The Great Buddha Hall (Daibutsuden) has been rebuilt twice after fire. The current building was finished in 1709, and although immense - 57 meters long and 50 meters wide, until 1998, it was the world's largest wooden building. It has been surpassed by modern structures, such as the Japanese baseball stadium 'Odate Jukai Dome'. 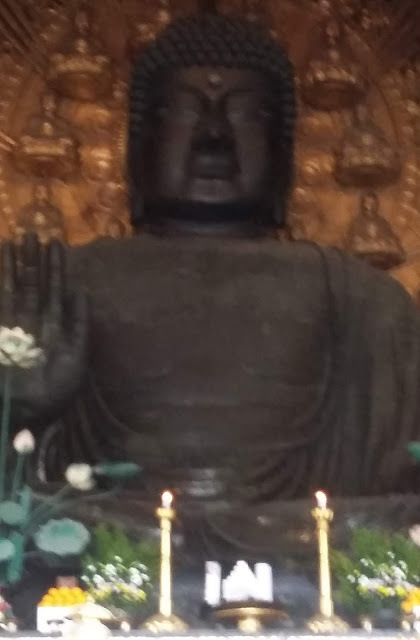 The Great Buddha Hall houses the world's largest bronze statue of the Buddha Vairocana, known in Japanese as Daibutsu. 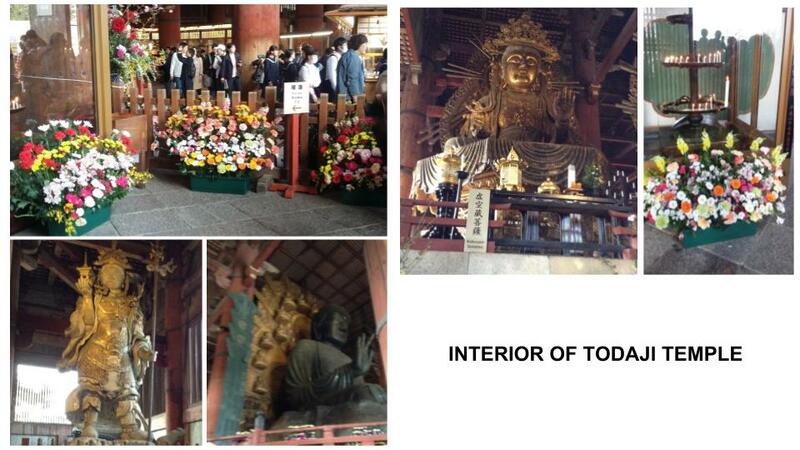 The Great Buddha statue has been recast several times for various reasons, including earthquake damage. The statue of Nyoirin-kannon is resplendent in golden color. The statues of guards among others, as well as the well-decorated interiors are attractive. 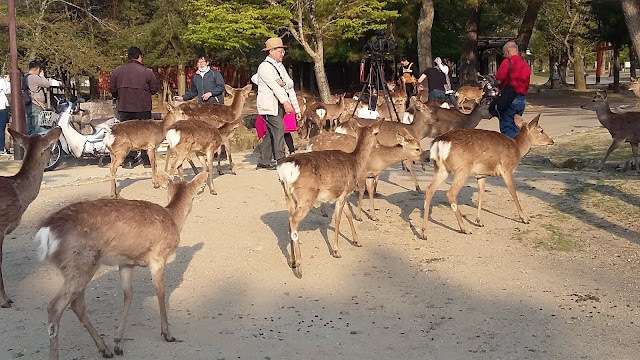 The Deer Park is adjacent to the complex where deer, regarded as messengers of the gods in the Shinto religion, roam the grounds freely and mingle with the visitors. 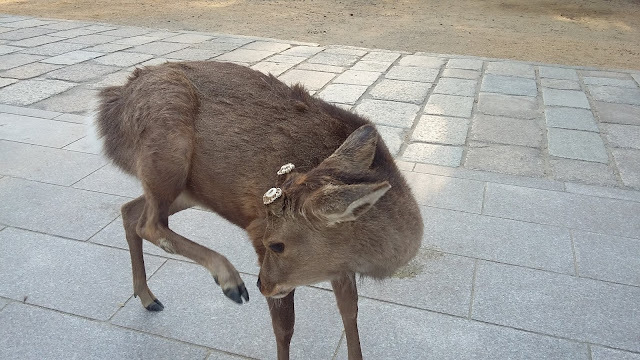 Some of them showed off their cute 'horn clips' - ornaments adorning the spots from where their horns have been removed. 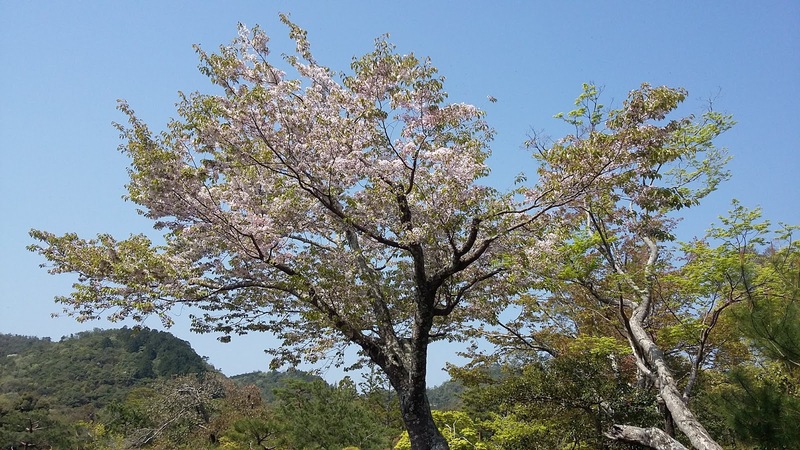 As everywhere, our eyes didn't fail to feast on cherry blossoms, though the peak seemed to have been just over. We then drove back to Osaka and first halted near Osaka Castle's Guard room surrounded by a moat. We could see just a wee bit of the Castle's green roof, beyond the Guard room. After that, we went to Nishinomaru Garden with around 600 cherry trees, is Osaka's most popular location for cherry blossom viewing and Hanami parties. Hanami ('flower viewing') is the Japanese traditional custom of enjoying the transient beauty of flowers with sake and feast; flowers ('hana') almost always refers to those of the cherry blossom ('sakura'). with such a colorful spread. These were the biggest and freshest 'sakura' we had seen so far - so we thought ..... If you ask me, certainly this was the USP of the tour! We could also climb up a few steep steps to get a great view of the Osaka Castle at a distance. Usually it is early dinner during this tour. At seven, we reached 'Akash', where we had tasty Indian dinner. The proprietor was from Pune and we were happy to catch up with him. 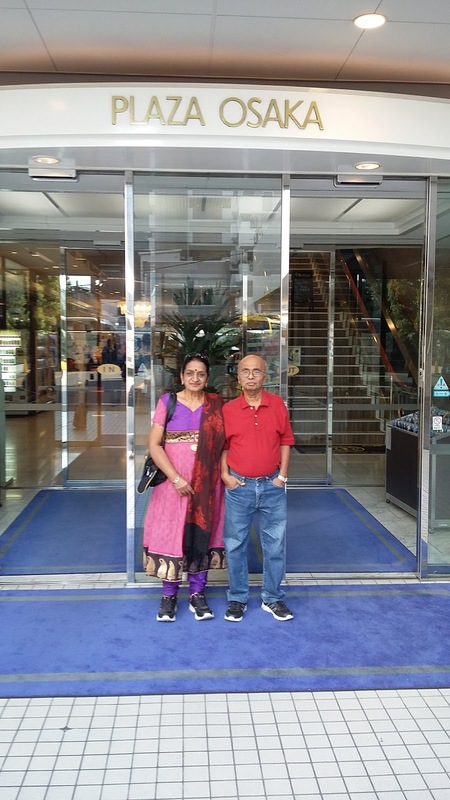 We returned to our hotel and spent a few minutes at the attractive lobby before retiring to our rooms. Next day we were visiting Hiroshima. 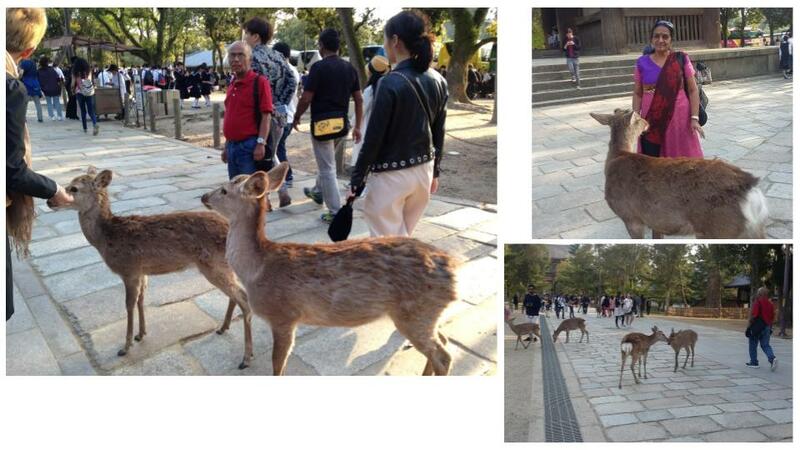 Loved to read your superb write-up of your visit to mystical Japan mam. You look so pretty mam on that purple pink dress. 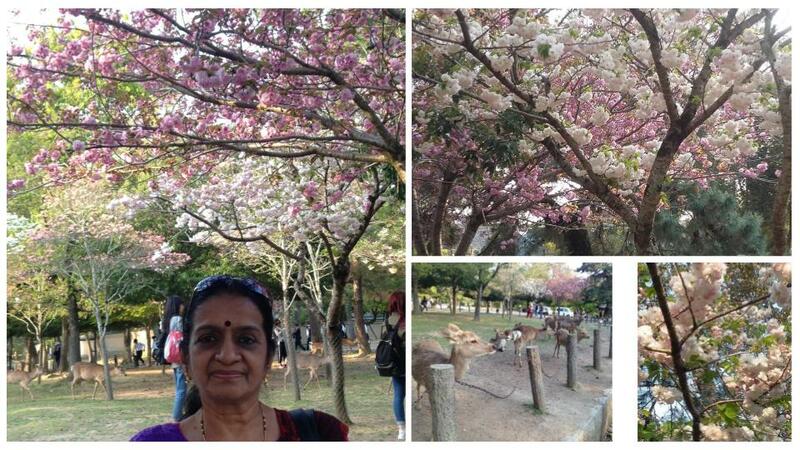 Was fascinated to see Sakura cherry blossoms: bright, brilliant and beautiful flowers... The moment when I had come across the word Sakura, I could also recollect Sakura of Egypt which happens to be the oldest pyramid almost in a dilapidated state but some renovations were going on during that time.. Loved your Osaka sojourn. Superb pics n notes. Awesome. You tempt the reader to travel n enjoy.